After the publication of Dirk Vanderbekes Theoretische Welten und literarische Transformationen. Die Naturwissenschaften im Spiegel der science studies und der englischen Literatur des ausgehenden 20. Jahrhunderts (2004), I was convinced that everything even distantly related to the theoretical field of science and literature was said, analyzed, criticized  in a word: done, and that only the occasional summary would be warranted for any future project. 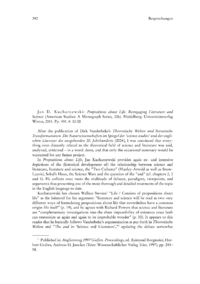 In Propositions about Life, Jan Kucharzewski provides again ex- and intensive depictions of the (historical development of) the relationship between science and literature, literature and science, the Two Cultures (Huxley-Arnold as well as Snow- Leavis), Sokals Hoax, the Science Wars and the question of the and (cf. chapters 2, 3 and 4). He collects once more the multitude of debates, paradigms, viewpoints, and arguments thus presenting one of the most thorough and detailed treatments of the topic in the English language to date.